It would seem that the Senate Education and Employment Committee has forgotten that the key stakeholders of higher education are the students, according to the Council of Australian Postgraduate Associations (CAPA). The tabling of the inquiry report into the Higher Education Support Legislation Amendment Bill 2017 has shown a remarkable bias by ignoring student submissions and testimonials. CAPA has notices an interesting trend between the recommendation from the committee compared to Labors’ and the Greens’ dissenting reports. The dissenting reports, in which student submissions and testimonials are considered, then the recommendation is to reject the bill. CAPA is disappointed that is was not invited to present at the public hearings given that it is the peak national representative body for postgraduate students in the country. Especially considering there are aspects of the bill that specifically focus on the provision of funding for postgraduate students. CAPA also questions the lack of any Aboriginal or Torres Strait Islander student representatives at the public hearings. Theses proposed changes to enabling courses are expected to directly disadvantage these students and it is essential that their input is sought. To have student voices ignored but allowing Andrew Norton two bites of the cherry is galling. Not only was Andrew Norton on the “expert panel” that developed this package but also presented a submission and appearing as a witness to the inquiry. CAPA would like to renew its call for senators to reject the bill in its current form. It is essential for the Senate to stand with students and protect Australia’s future. The Network of Women Students Australia (NOWSA) has just celebrated her 30th year anniversary in the 2017 annual conference which was held in ANU –the same place where the first NOWSA conference was held in 1987. My first impression when I heard ‘NOWSA’ was a conference that would contribute something to the conversation over gender equality in the context of women’ students in Australia. NOWSA Conference was a 5-day conference which consist of keynote speech, a dozen of workshops (caucus and pro-caucus) and panel discussions, as well as other activities such as art classes, movie, and counselling. Before going further, I have to be honest with you that I am not an expert on the field of feminism nor on women issues. The 2017 NOWSA conference was my first women/feminism conference in my life. I was excited, thrilled, and nervous at the same time. I was keen to learn about feminism as an idea and practice, but also nervous that I could not ‘behave’ or ‘talk’ as the community expected (‘common rules or norms’ which not quite common for me), and dozen of collective grievance officers made me even more nervous. At the first day of the conference on 16th of July, all participants were refreshed, in my case I was introduced, by the panel discussions on Practicing Intersectionality Feminism. For whom I was still trying to familiarize with the concept. Intersectionality is a way to understand a exclusive condition that every woman has a bundle of identities that make us a unique individual. This package of identities can’t be untangled, because it’s intertwined and interrelated with each other. Introduced in 1989 by professor Kimberlé Crenshaw, intersectionality is used to explain how oppressions that women face is influenced by the multi-layered facet of women’ identities. For instance, discriminative practice that someone face, is related to her identities as a woman from her cultural, socio-economic, religion (and other possible) backgrounds. I found intersectionality as a useful and handy concept to understand discrimination and other kind of oppressions that women face in daily life. The second day was my favourite because of the two insightful panels held at the Parliament House; the Representation of Women in the Media and Women in the Male Dominated Fields. 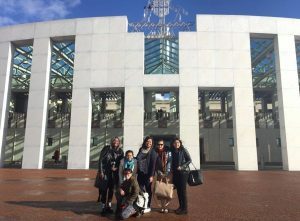 The first session at the Parliament House was the panel discussion on how women, most of the time, are being represented unfairly in the media. The speakers came from different professional backgrounds; mainstream media, private sector, and academic. The three panellists discussed how they view and critiqued the unjust representation of women in the media from different perspectives, and how they try to deal with it. The second panel that afternoon was no less exciting, the four ladies’ speakers were sharing their personal stories; how to strive in male dominated fields in STEM, criminal justice, and business. Each of them own very strong characters of what I consider as a feminist; stand for what they believe is right and support other women as solidarity. The third and fourth day of the conference were packaged into Sexual Assault and Sexual Harassment (SASH) related topics. The Universities Australia and the Human Right Commission conducted a survey on SASH, and the result will be launched by August 1. Related to this topic, I attended the workshop on how to broaden and strengthen the advocacy on the SASH issue, including the upcoming SASH survey’ result and the existing ‘Respect.Now.Always’ campaign. During the discussion at that workshop, one identified common problem on the Respect.Now.Always campaign was how to increase universities’ involvement to be more effective in advocating this issue. SASH remains a major issue in Australia, and very close to women students’ life. Thus, after the SASH survey is released on August 1, several students’ peak bodies will work together and support the universities to advocate this issues. Finally, as my first impression of NOWSA was related to gender equality context, I viewed that Women Students Network is a good start but we need a more sustainable and continuous movement. I recognised that the underlying problems of gender inequality are complex and interrelated with other problems. To make it even more difficult, gender inequality also can be transmitted to the next generations, as Amartya Sen said, ‘the intergenerational transmission of disadvantage’ or when we are in a disadvantage positions, we’re more likely to transfer that conditions to our kids and later grand-kids. In most cases, women issue can’t be separated to political, socio-economic, cultural, and the like. Gender equality, like other wicked problems, becomes so complicated and sometimes make us frustrated even before we try to do something. This thought and my experience at NOWSA brought me to an attempt to answer my first question: Does NOWSA bring something to promote gender equality at the end? The answer is yes absolutely. At a certain extent, all kind of positive activities such as discussing, sharing, and networking are contributing to gender equality in a sense of strengthen knowledge, capacities and women’ solidarity. However, what NOWSA does is still insufficient, even in the context of women students’ empowerment. I understand that no one-stop solution for solving this issue and NOWSA never meant to solve the problem by herself. Thus, NOWSA, as the women’ student network, ought to be the leader in promoting women student’ empowerment by continuing build women’ network, solidarity, and capacity building. On the top of it, in the long run, I do wish that NOWSA can be one effective means to promote genuine gender equality through her capacities as the leader of women student’ network in Australia. a mum, an international student who studies public policy at ANU, a Muslim, coming from developing country (Indonesia), omnivore, loves Haruki Murakami and enjoys Michael Bublé. On August 8th, the Higher Education Sector will be united in one message: to bin the higher education bill. The Council of Australian Postgraduate Associations (CAPA) will be joining the National Tertiary Education Union (NTEU) and the National Union of Students (NUS) on August 8th in protest of the Higher Education Reform Bill. This legislation is set to hobble the Australian research and innovation economy and ruin our ability to compete on an international scale. It is the next step in punishing Australian students for the mistakes of government budget mismanagement. Not only do universities provide a huge boost to the Australian economy, they are also some of the biggest employers wherever there is a campus. These cuts could result in lost jobs, suffering regional hubs, struggling graduates, and seriously hurt one of Australia’s biggest exports. Then there is the moral argument. How can the Australian government look young Australians in the eye when all they do is cut away at our future? These protests will be occurring at all universities that understand their role in society and where academic freedom is encouraged. We are calling on all postgraduate students to join with their local NTEU branches at campus events on August 8th. The findings from today’s release of the Australian Human Rights Commission report into sexual assault and sexual harassment at Australian Universities paints a concerning picture for students according to the Council of Australian Postgraduate Associations (CAPA). While the results from this survey will not come as a surprise to many student leaders they do provide the groundwork needed to make real change. For CAPA one of the greatest concerns is the prevalence of sexual harassment and assault that is perpetrated by staff on campus toward postgraduate students. These results indicated that sexual violence from staff towards postgraduate students was higher than towards undergraduates. What’s worse is that given undergraduates outnumber postgraduates almost 3:1 is that these numbers present a grim story for the student/staff relationship at this level. The power imbalance between research students and staff at the postgraduate level is a long-standing issue for Australian Universities. Reporting is also a recognized issue within this report with many universities having vague or absent reporting structures when it comes to sexual assault and sexual harassment. For postgraduate students, whose supervisors hold their career in their hands, this is also an issue of a power imbalance and fear. CAPA’s 19 recommendations to address the issues of sexual assault and sexual harassment are aimed at enabling students to report these issues without fear of reprisal. CAPA will work with Universities Australia, The Australian Council of Graduate Research, and Vice-Chancellors to ensure that this issue is put to an end. Students in need of help or support can call Universities Australia’s 24/7 phone line on 1800 572 224, or visit their university’s dedicated counselling service – details of which can be found at University Australia’s ‘Where to seek help at your university’ web page.